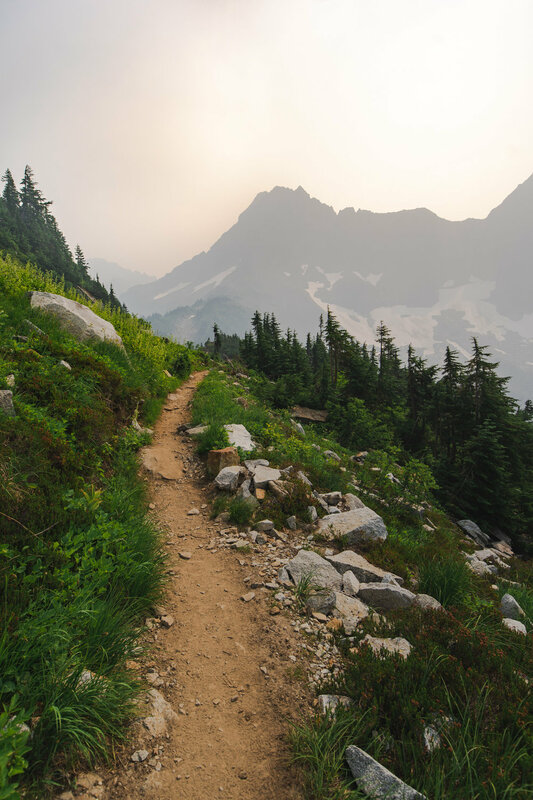 This hike inside of the North Cascades National Park in Washington has some of the best views around. 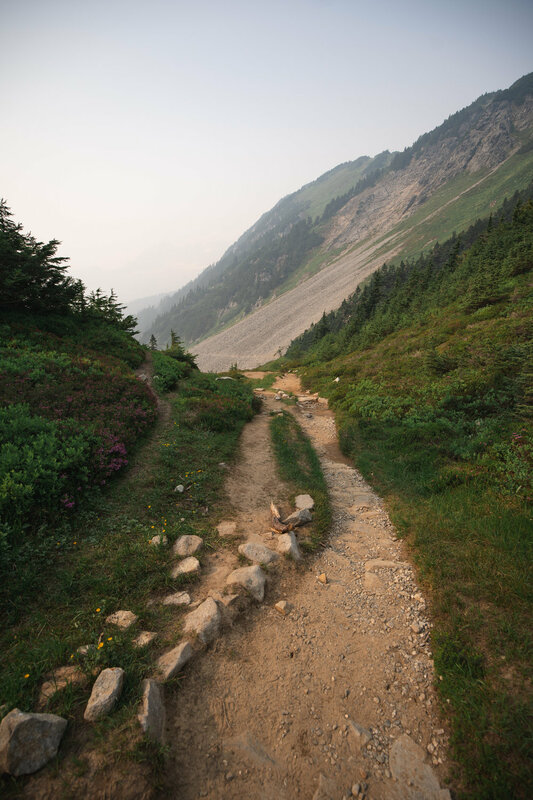 A 23.8 mile drive West from Marblemount, WA will get you to the trailhead. 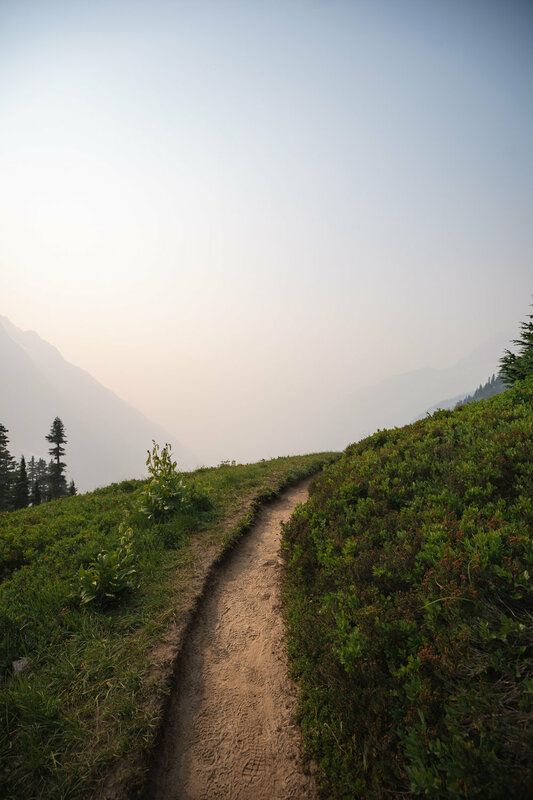 The hike up to Cascade Pass (from the parking lot) is approximately 3.7 miles one way and another 2.2 miles up to Sahale Glacier with a 3900 ft. total elevation gain! 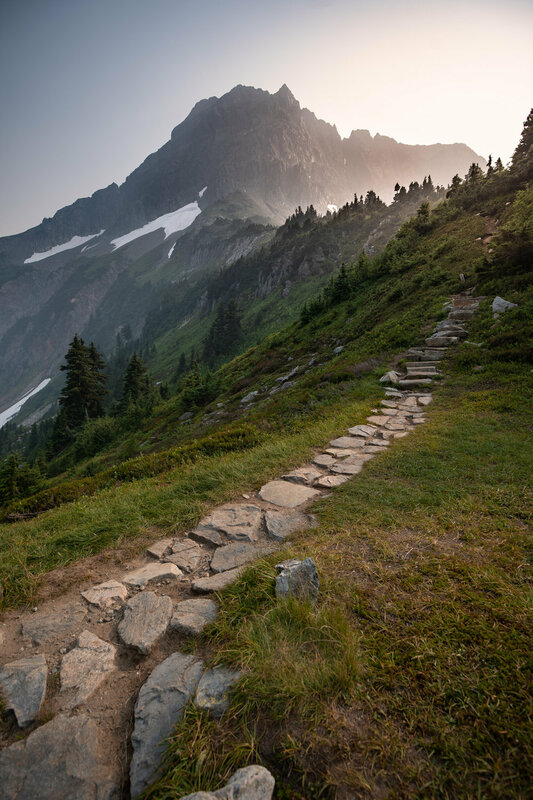 Plan for at least 5-6 hours for the hike so that you can appreciate the jaw-dropping scenery. This post is a trail guide, and a first-hand account of my own journey up the mountain! 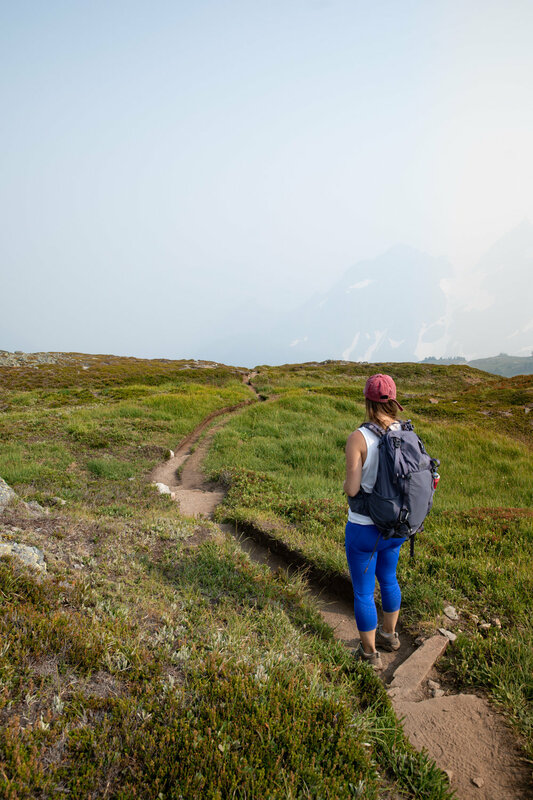 The Sahale Glacier hike is one of the most sought after backpacking camping sites because you are literally on the edge of a glacier surrounded by the peaks of the mountains below you. This site is on a permit system too, so you have to go to Ranger Station in Marblemount to get an overnight permit for a camping spot. There is a line that starts to form early at 6AM for a 7AM opening. Luckily, I was one of the first to get there and was able to get the last permit for the hike! However, the ranger strongly recommended that we didn’t go because of the poor air quality and low visibility on top of the mountain. The week that we were in Washington, wildfires started to break out from local heat lightning. Visibility was not great and you could be within 1 mile of Mt. Rainier and have little to no visibility of the mountain. After going back to our campsite and talking it over, we decided that it wasn’t worth the health risks for spending an entire night in the smog. The rangers equated it to smoking 7-10 cigarettes/hour. 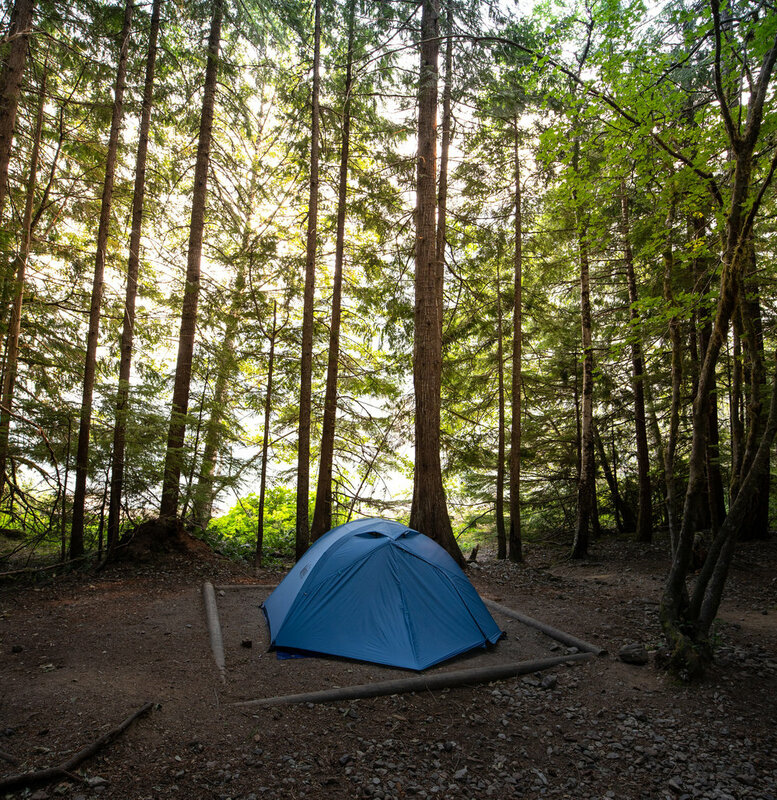 This was our campsite that we already had at the Colonial Creek Campground, right on Diablo Lake. Literally footsteps from the turquoise waters. It was so hard to decide what to do. 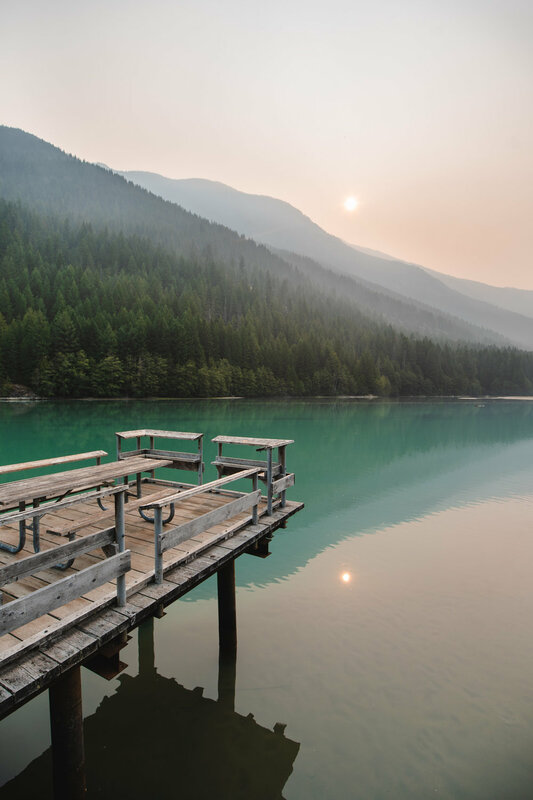 Do we just do a day hike up the mountain and come back to this pristine spot, or hike up the mountain and sleep under the (hazy) and smoke filled sky? After discussing for an hour over breakfast, we decided to stay at this campsite. It was very bittersweet since we still were going to do the hike but we have never stayed on top of a mountain before! The first hour or two of the hike featured countless switchbacks. These weren't too steep however became repetitive after awhile. It was completely fine though, I would rather get this out of the way in the beginning and then have a great level hike on the top any day of the week! After an hour of hiking, sweating, and singing to keep the bears away, we made it to the plateau point! We were only halfway done, but everything opened up and we had views on top of views. The mountains became somewhat more visible and we knew we were close to the actual “pass”. Finally we started to see more people on the trail as well. Do you ever go out into the forest and see no one for hours? That was this hike. We were finally getting close and arrived at a falling rock / scrambling area on the trail. Every step needed to be accounted for so we didn’t trip! We eventually made it to Cascade Pass! This is the shortest area in between the mountains that lead in many directions. We stopped for a minute and tried to figure out what to do since it somehow was now 5PM. Coincidentally, a few chipmunks found us looking for food at the crossroad. It was getting a bit late in the afternoon, so we debated if it was worth it to go up to the Sahale Glacier. This would add an extra 2-3 hours to our journey and we wanted to make it back to the car before dark on account of the possibility of bears. It took a lot convincing and conversations with fellow hikers, but we did it! 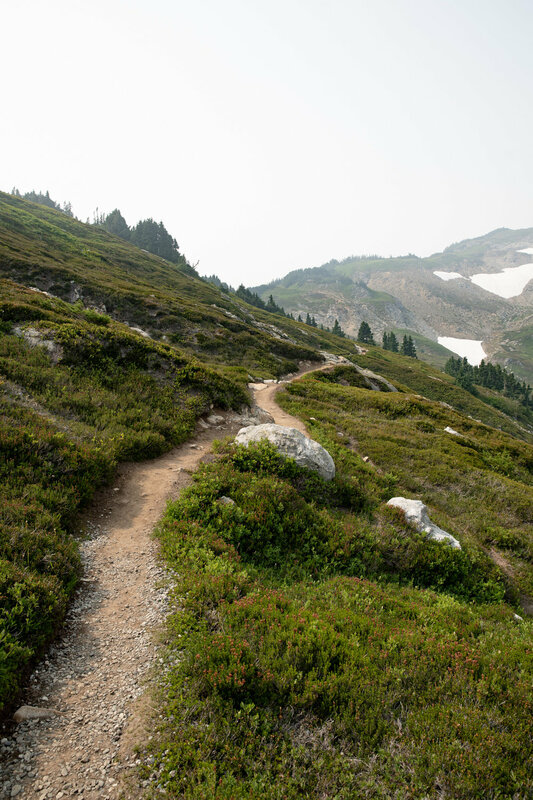 This arm of the trail was filled with more exposed switchbacks with smaller animals and birds running around everywhere. We started to see more and more hikers on our way up the mountain. These hikers all stated that there were multiple bear sightings and mountain goat activity nearby! I was determined to see at least some form of wildlife when we were up there. Once we summited this leg of the trail it was like being on top of a green paradise. Rolling hills with rocky peaks in the distance made this entire journey worth it! Also, Doubtful Lake was finally visible! 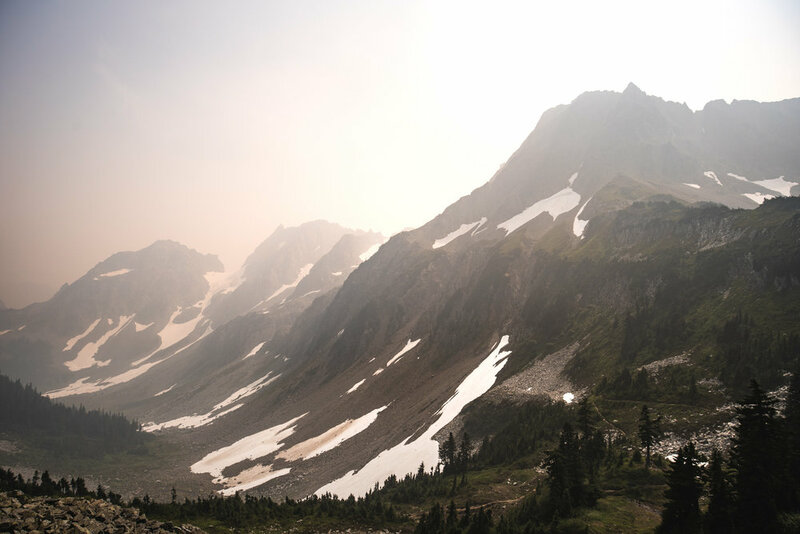 Mountains should be visible once you are on top of Cascade Pass and Sahale Arm. Actually you should be able to see mountains every step of the way! Sadly, this was about all you could see the week we came here. It was amazing to say the least, but left a lot to be desired at the same time. We started to make our way back down the mountain before sunset and finally saw what we have been waiting for! We never did see a bear on the trail, but there were so many reports of them that it was a good idea to get back to the car before dark! After the sun was setting behind the initial group of mountains, it was finally time to go home. This entire hike took us approximately 5-6 hours there and back with stopping a few times for snacks and photos. Well worth it for anyone in the North Cascades area. We are already planning our journey for next time!